The Eastern-Midlands Waste Regional Office (EMWRO) was delighted to team up with Dublin City University (DCU) students on a social media campaign designed to encourage the use of reusable coffee cups on campus. The campaign, dubbed KeepMeDCU, launched on Monday 21st November as part of European Week of Waste Reduction 2016 (EWWR) and will run until Friday 26th November. The campaign is one of just two EWWR waste prevention actions registered for Ireland. The campaign aimed to reduce the volume of disposable cups used on the campus. It is estimated that 1 million disposable coffee cups are used each year in Ireland and that using just one disposable cup each day for a year creates about 11kg of waste. While many throw-away cups carry a recycling symbol, the plastic coating used on such cups means that they are generally not recyclable at all -instead they must be consigned to landfill, where each cup takes weeks to break down. 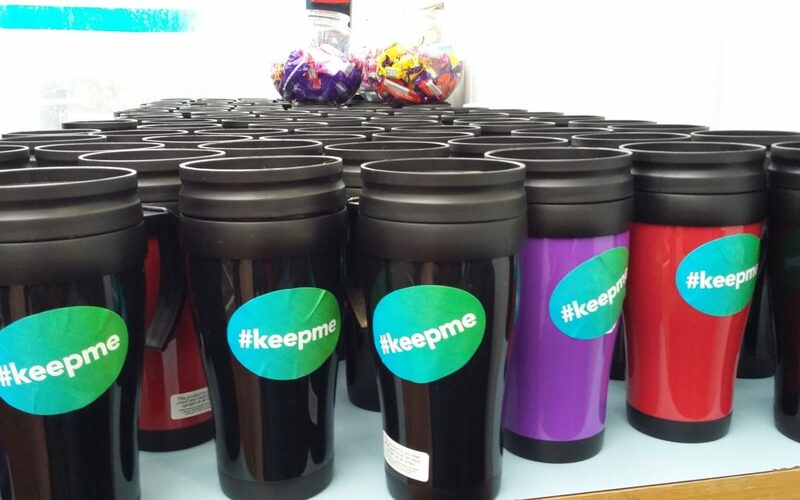 At the KeepMeDCU launch 100 reusable travel mugs were given away free to students, most of whom interacted with the social media campaign through likes, posting selfies and in one case doing a mannequin challenge! Coffee outlets on campus joined the effort by giving a cash discount to anyone using a reusable cup for the duration of EWWR. Follow the campaign on Twitter @KeepmeDCU, hashtag #keepme or on Facebook at Keep Me DCU.